The spell point system presented here allows casters to more freely pick and choose which spells they cast each day. Every spellcaster has a reserve of spell points based on class and level (see Table: Spell Points Per Day). Characters also gain bonus spell points from a high ability score (just as a normal spellcaster would gain bonus spells from a high ability score; see Bonus Spell Points and Bonus Spells, below). These spell points provide the magical power behind the caster’s spells: He spends a number of spell points appropriate to the spell’s level to cast the spell (see Casting Spells, below). Once spent, spell points are expended until the caster has sufficient time to rest and prepare new spells (see Preparing Spells, below). The spell point system dramatically expands the versatility of a spellcaster. Since he’s no longer tied to using a specific number of spell slots, he can much more easily adapt to situations. 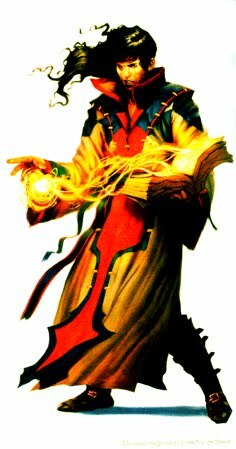 In effect, spell points make all classes work more like the sorcerer, and make the sorcerer (or bard) work even more like the sorcerer. In general, spellcasters become more powerful—though they aren’t capable of casting any spell they couldn’t cast before, they are now capable of casting more high-level spells per day and more of whichever spells they need. If a 15th-level cleric needs to cast heal a dozen times during an adventure, he can do that (though not much else). One balancing factor is the cost for casters to increase the damage dealt by their spells. This cost helps to maintain balance between spells of different level. If you didn’t have to pay more for a 9d6 lightning bolt than for a 5d6 lightning bolt (a 3rd-level spell costing 5 spell points), then the 9d6 lightning bolt would cost barely more than half as much as a 9d6 cone of cold (a 5th-level spell costing 9 spell points), even though both spells deal equal damage. If you use this variant, consider adding other game elements that influence (or are influenced by) spell points. These might include magic items that grant (or cost) spell points, feats that grant bonus spell points (or make certain spells cost fewer spell points to cast), special abilities that drain spell points from casters, and so forth. With this variant, spellcasters still prepare spells as normal (assuming they normally prepare spells). In effect, casters who prepare spells are setting their list of “spells known” for the day. They need not prepare multiple copies of the same spell, since they can cast any combination of their prepared spells each day (up to the limit of their spell points). For example, Boredflak the 4th-level wizard has an Intelligence score of 16. When using the spell point system, he would prepare four 0-level spells, four 1st-level spells (three plus his bonus spell for high Int), and three 2nd-level spells (two plus his bonus spell for high Int). These spells make up his entire list of spells that he can cast during the day, though he can cast any combination of them, as long as he has sufficient spell points. Any spellcaster who would normally receive bonus spells for a high ability score receives bonus spell points instead. In effect, the character can simply cast more of his spells each day. To determine the number of bonus spell points gained from a high ability score, first find the row for the character’s ability score on Table: Bonus Spell Points. Use whichever ability score would normally award bonus spells for the character’s class (Wisdom for clerics and druids, Intelligence for wizards, and so forth). Next, find the column for the highest level of spell the character is capable of casting based on his class level (even if he doesn’t have a high enough ability score to cast spells of that level). At the point where the row and column intersect, you find the bonus spell points the character gains. This value can change each time his ability score undergoes a permanent change (such from an ability score increase due to character level or one from a wish spell) and each time his level changes. For example, Boredflak the 4th-level wizard has an Intelligence score of 16 and is capable of casting 2nd-level spells. The number on Table: Bonus Spell Points at the intersection of the 16-17 row and the 2nd column is 4, so Boredflak has 4 extra spell points to spend each day (in addition to the 11 points he gets for being a 4th-level wizard). If Boredflak’s Intelligence were increased to 20 because of a fox’s cunning spell or a headband of intellect +4, he wouldn’t gain any additional bonus spell points, since those effects produce temporary changes, not permanent changes. However, when he reaches 5th level, his bonus spell points would increase from 4 to 9 (since he is now capable of casting 3rd-level spells and thus uses that column), and his overall total would increase from 15 to 25. A character who would normally receive bonus spells from a class feature (such as from wizard specialization or access to a domain) can instead prepare extra spells of the appropriate levels, domains, and/or schools. The character doesn’t get any extra spell points (and thus can’t cast any more spells than normal), but the added flexibility of being able to use the bonus spell more than once per day makes up for that. For instance, a specialist wizard can prepare one extra spell from the chosen school of each spell level that he can cast. A cleric can prepare one domain spell (chosen from among his domain spells available) of each spell level that he can cast. For example, if Boredflak were an evoker, he could prepare one additional spell per level, but that spell would have to be from the evocation school. Once it is prepared, he can use that spell just like any of his other spells, casting it as often as he has spell points. Another example: At 1st level, Haigh the cleric gains a bonus 1st-level spell, which must be selected from one of his two domains. Once it is prepared, he can use that domain spell just like any of his other spells, casting it as often as he has spell points. For class features that grant bonus spells of a nonfixed spell level (such as the dragon disciple’s bonus spells), the character instead gains a number of bonus spell points equal to twice the highest spell level he can cast, minus 1 (minimum 1 point) each time he gains a bonus spell. This is a fixed value—it doesn’t increase later as the character gains levels—though later rewards may be larger as appropriate to the character’s spellcasting ability. For example, a 4th-level fighter/4th-level sorcerer who gains a level of dragon disciple gets a bonus spell. Since the character is capable of casting 2nd-level spells, he receives 3 bonus spell points (2 × 2 = 4, 4 - 1 = 3). Characters who cast all their spells spontaneously—such as bards and sorcerers—don’t have to prepare spells. They can cast any spell they know by spending the requisite number of spell points. Characters with the ability to cast a limited number of spells spontaneously (such as druids, who can spontaneously cast a summon nature’s ally spell in place of another spell of the same level) are always treated as having those spells prepared, without spending any spell slots to do so. Thus, they can cast such spells any time they have sufficient spell points. Under this system, the Healing domain becomes a relatively poor choice for good-aligned clerics, since they gain less of a benefit for that domain. See Spontaneous Divine Casters for ways to solve that dilemma. Spellcasters regain lost spell points whenever they could normally regain spells. Doing this requires the same amount of rest and preparation or concentration time as normal for the class. Without this period of rest and mental preparation, the caster’s mind isn’t ready to regain its power. Spell points are not divorced from the body; they are part of it. Using spell points is mentally tiring, and without the requisite period of rest, they do not regenerate. Any spell points spent within the last 8 hours count against a character’s daily limit and aren’t regained. 0-level spells cost no spell points to cast. If a spellcaster is capable of casting 0-level spells, he can cast a number of 0-level spells each day equal to three + the number of spell points gained by that class at 1st level. Each spell costs a certain number of spell points to cast. The higher the level of the spell, the more points it costs. Table: Spell Point Costs describes each spell’s cost. Spellcasters use their full normal caster level for determining the effects of their spells in this system, with one significant exception. Spells that deal a number of dice of damage based on caster level (such as magic missile, searing light, or lightning bolt) deal damage as if cast by a character of the minimum level of the class capable of casting the spell. Spells whose damage is partially based on caster level, but that don’t deal a number of dice of damage based on caster level (such as produce flame or an inflict spell) use the spellcaster’s normal caster level to determine damage. Use the character’s normal caster level for all other effects, including range and duration. For example, a fireball deals a number of dice of damage based on the caster’s level, so when cast by a wizard using this system, it deals 5d6 points of damage (as if cast by a 5th-level wizard, which is the minimum level of wizard capable of casting fireball). A sorcerer who casts the same spell deals 6d6 points of damage, since the minimum level of sorcerer capable of casting fireball is 6th. A character can pay additional spell points to increase the dice of damage dealt by a spell. Every 1 extra spell point spent at the time of casting increases the spell’s effective caster level by 1 for purposes of dealing damage. A character can’t increase a damage-dealing spell’s caster level above his own caster level, or above the normal maximum allowed by the spell. For example, even at 7th level, Boredflak’s lightning bolts deal only 5d6 points of damage (just like a 5th-level wizard) unless he spends extra spell points. If he spends 1 extra spell point (making the lightning bolt cost 6 points rather than 5), the spell deals 6d6 points of damage. A second extra spell point would increase the damage to 7d6 points, but he can’t spend more points than this, since his caster level is only 7th. Were he 10th level or higher, he could spend a maximum of 5 extra spell points on this spell, raising the damage up to 10d6, the maximum allowed for a lightning bolt spell. Similarly, his magic missile spell only shoots one missile unless he spends extra spell points. An extra 2 spell points increases the caster level from 1st to 3rd, granting his one additional missile. He can spend a maximum of 6 additional spell points in this manner, increasing his effective caster level to 7th for damage purposes and granting his a total of four missiles. If he were 9th level or higher, he could spend a maximum of 8 extra spell points, granting his five missiles (just like a 9th-level caster). In the spell point system, a GM has two options for how to adjudicate metamagic effects. In either case, casters need not specially prepare metamagic versions of their spells—they can simply choose to apply the metamagic effect at the time of casting. Doing this does not increase the spell’s casting time. The first option is to apply an additional spell point cost to any spell cast with a metamagic feat. This option allows a character maximum flexibility in his choice of spellcasting. Effectively, the character must pay for the spell as if it were a higher-level spell, based on the adjustment from the metamagic feat. If the metamagic effect(s) would increase the spell’s effective level above what he is capable of casting, he can’t cast the spell in that way. For example, at 7th level Boredflak is capable of casting 4th-level spells. He could empower a 2nd-level spell, or still a 3rd-level spell, or empower and still a 1st-level spell. He couldn’t empower a 3rd-level spell or still a 4th-level spell (since doing either of those things would raise either spell’s effective spell level to 5th). The spell’s caster level for purposes of damage-dealing effects (see above) doesn’t change, even if the metamagic effect increases the minimum caster level of that spell. For instance, a quickened fireball still deals damage as if cast by a 5th-level caster unless the caster chooses to pay additional spell points to increase the caster level. For example, if Boredflak empowered his magic missile, it would cost his 5 spell points (as if it were a 3rd-level spell) but would shoot only one missile and deal (1d4+1 × 1.5) points of damage. If he spent an additional 6 spell points (for a total of 11), the caster level of the magic missile would increase to 7th, and the spell would shoot four missiles dealing a total of (4d4+4 × 1.5) points of damage. The second option is simpler but less flexible. In this option, each selection of a metamagic feat allows a character to apply the feat’s effects three times per day at no additional spell point cost. The normal limit for maximum spell level applies (a 7th-level wizard can’t empower any spell higher than 2nd level, for instance). You could even combine these options, allowing a spellcaster with a metamagic feat to use the feat three times per day for free, but any additional uses in the same day would cost extra spell points. Only choose this combination approach if you’re comfortable with characters throwing around a lot of metamagic spells. A character with nonstacking spellcasting ability from multiple classes (such as a cleric/wizard) has a separate pool of spell points for each spellcasting class. Such characters may only spend spell points on spells granted by that class. Bonus spell points from a high ability score apply to each pool separately, even if the same ability score is tied to more than one spellcasting class. In the rare situations when a character has prepared or knows the same spell in two different slots (such as a druid/ranger preparing delay poison as both a 2nd-level druid spell and a 1st-level ranger spell), the character can cast the spell using either pool of spell points, but the spell is treated as being cast by a caster of the level of the class from which the spell points are drawn. For example, a 5th-level cleric/2nd-level bard has 15 spell points (plus bonus spell points for high Wisdom) for his cleric spells and 0 spell points (plus bonus spell points for high Charisma) for his bard spells. When he casts cure moderate wounds, the points for that spell must be drawn from his pool of cleric spell points. If he knows cure light wounds as a bard spell and has also prepared it as a cleric spell, he may cast it either as a cleric or as a bard. As a cleric spell, the spell is cast at 5th level and heals 1d8+5 points of damage; as a bard spell, it is cast at 2nd level and heals 1d8+2 points of damage. When a character would lose a spell slot (such as from gaining a negative level), he instead loses the number of spell points required to cast his highest-level spell. Spells that allow a character to recall or recast a spell don’t function in this system. (It doesn’t make any sense to have a spell that gives you more spell points, since you’re either paying more than you get, getting nothing, or getting more than you paid.) Items that function similarly can work, but differently— they restore a number of spell points required to cast a spell of that level. A pearl of power for 3rd-level spells, for instance, would restore 5 spell points to a character’s pool of available points when activated. In the vitalizing system, spellcasters can potentially cast a great number of spells in a day, but every spell cast is a potential burden on the caster’s health and vitality. Reaching for and directing magical energy is a dangerous and taxing exercise, at least as difficult as heavy labor or prolonged exertion. This variant of the spell point system does not change the way a character prepares spells, casts spells, regains spell points, or any of the other rules from that system. However, the spellcaster’s pool of spell points represents a physical, not just mental, limit on his spellcasting power. When a spellcaster’s spell point pool falls to half of his maximum or less, he becomes fatigued. When his spell points drop to one-quarter of his maximum or less, he becomes exhausted. For example, at 1st level Haigh the cleric has 3 spell points (2 from his level, +1 bonus point for high Wisdom). He enters a fight by casting bless on his allies, spending 1 of his 3 spell points. Doing this has no ill effect on Haigh, since he still has more than half of his maximum spell points remaining. If, during the fight, he then casts divine favor, spending another spell point, he now becomes fatigued, since he has only one-third of his spell points remaining. After the fight, he spontaneously casts cure light wounds on Kroh, spending his last spell point. Not only has he exhausted his spells for the day, but he has exhausted his body as well. In the vitalizing system, spellcasters must rest to recover their spell points and restore their physical well-being. A character’s spell point total is tied directly to his level of fatigue. If an exhausted character rests for 1 hour, he becomes fatigued—and his spell point total rises to one-third of his normal maximum (round fractions down). A second hour of rest increases the spellcaster’s spell point total to two-thirds of his maximum. It takes another 6 hours of rest to replenish the last one-third of his spell points and shake the physical effects of the spellcasting. Spells that remove fatigue and exhaustion (such as heal and restoration) leave the recipient with a spell point total equal to two-thirds of his normal maximum. As in the standard rules, a spellcaster must rest for a full 8 hours before preparing a fresh allotment of spells for the day. Even if an exhausted spellcaster regains his lost energy and spell points, he can’t change the spells he has prepared without 8 hours of rest. If a spellcaster is subjected to some other effect that would make him fatigued or exhausted, he loses spell points accordingly. If he becomes fatigued, his spell point total drops to one-half his normal maximum (round down), and if he becomes exhausted, his spell point total drops to one-quarter his normal maximum. As a further variant of this system, all spellcasters gain bonus spell points based on their Constitution scores rather than the ability score that normally grants bonus spells. This variant reflects the idea that spellcasting power is tied to the caster’s physical health. It also essentially requires spellcasters to have two high ability scores, though most spellcasters are happy to have a high Constitution score anyway. A second optional variant would allow a spellcaster to exceed his normal pool of spell points, but at great personal risk. Doing so successfully requires a Concentration check (DC 20 + spell level). Each time a character casts a spell for which he does not have sufficient spell points and subsequently fails the Concentration check, he takes both lethal and nonlethal damage equal to the level of the spell cast. A desperate (or unwary) spellcaster can literally cast himself into unconsciousness in this manner.